4-6 medium red, yellow or orange bell peppers. Remove the top, cores and seeds. Bring 4 quarts of water to a boil in a large stock pot. Add 1 tablespoon of salt and then bell peppers. Cook for about 3 minutes until they begin to soften. Use a slotted spoon to remove the peppers and to place them on a paper towel. Return the water to a boil, add the rice and cook for about 13 minutes until tender. Drain the rice and set aside. Adjust the rack to the middle position and preheat the oven to 350. Heat the oil in a 12″ skillet over med-high heat until shimmering. Add the onions and cook for about 5 minutes so they are soft and beginning to brown. Add the ground beef and cook until no longer pink. Stir in the garlic and cook for another 30 seconds.Transfer the mixture to the bowl with rice and stir in the tomatoes, 1 cup of cheese, parsley, salt and pepper to taste. Stir the ketchup and 1/4 cup reserved tomato juice in a separate bowl. 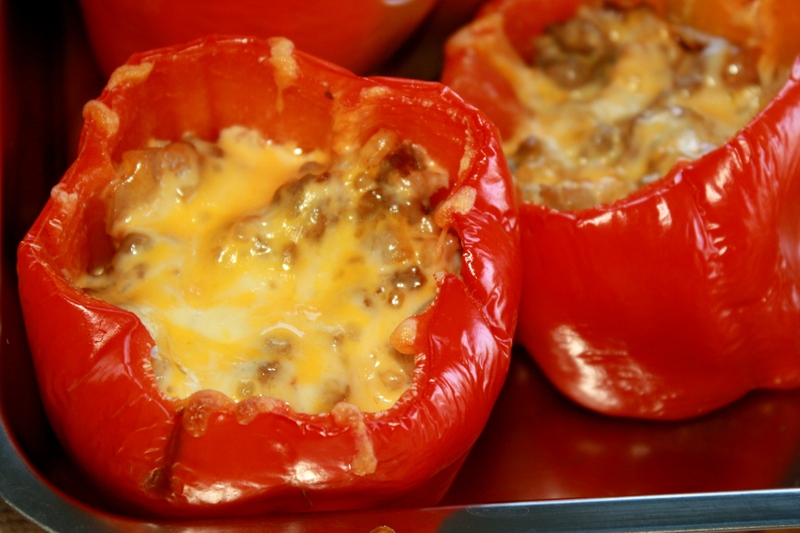 Place the peppers cut side up in a 9″ square baking dish or a muffin tin. Scoop the filling evenly into the peppers. Spoon 2 tablespoons of the ketchup mixture over each pepper and sprinkle the top with cheese. Bake until the cheese is browned 25-30 minutes. Serve immediately- yum! !